It has been a couple weeks since my last post, but finally something picture worthy has taken place. 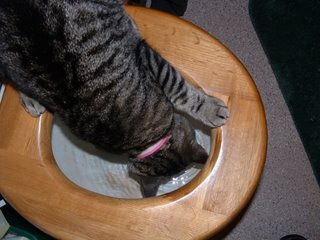 The picture you see is our kitty drinking from the toilet. This is a common thing for dogs, but to my knowledge ours is the first cat to perform such a dangerous feat - she hovers dangerously close to a cats worst nightmare, pools of water. Please be aware she isn't forced to do this, we provide her with delicious clean water in a glass bowl only feet from the bathroom. So, Is there a lesson for us here? I just thought that maybe we shouldn't settle for toilet water either, but even though it takes a little more work we can drink from the living water. How often do we try to fix things, or "feel" better by filling our minds with entertainment, food, or stuff when what we really need is encouragement from the true source of life. The Bible, Jesus. Those are my random thoughts of the day. So use the toilet water when you WANT it, but go to the "living" water when you NEED it! Have a great weekend. Jesus answered her, If you knew the gift of God and who it is that asks you for a drink, you would have asked him and he would have given you living water. Sir, the woman said, ?you have nothing to draw with and the well is deep. Where can you get this living water. Are you greater than our father Jacob, who gave us the well and drank from it himself, as did also his sons and his flocks and herds? Jesus answered, ?Everyone who drinks this water will be thirsty again, but whoever drinks the water I give him will never thirst. Indeed, the water I give him will become in him a spring of water welling up to eternal life.